We removed our bath tub in the main bath to replace it with a shower. 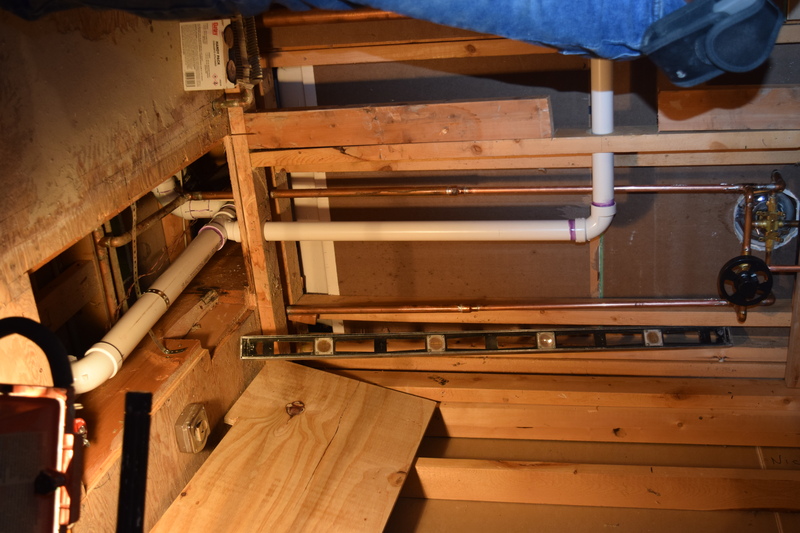 The tub had a 1 1/2″ drain line. The code requires a 2″ drain for most shower drains, based on the gallons per minute of your shower head. Not wanting to go through that issue, I decided to put in a 2″ drain. The difficult part was determining where to find and tap in to a 2″ line. 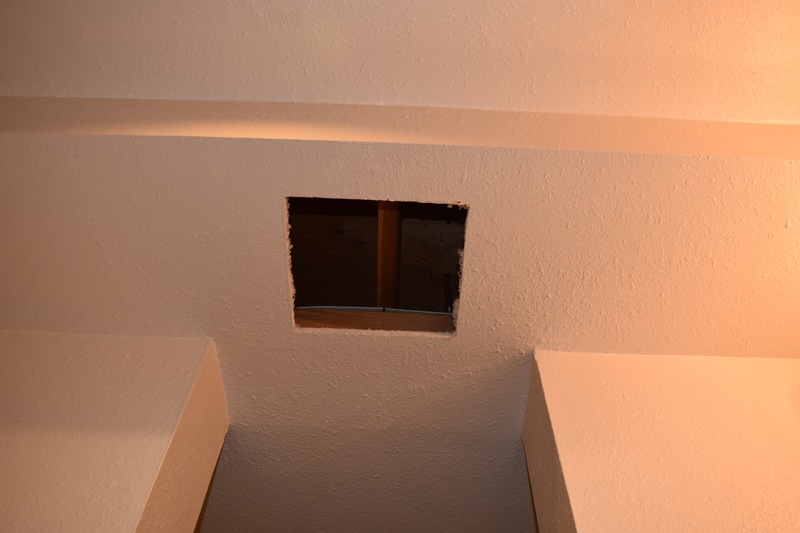 Long story short I cut a hole in the basement bath ceiling directly below where the tub drain was and removed some subfloor in the main bath above to expose the area where I needed to install the drain. First step was to cut off and seal the old 1 1/2″ drain. I used a RotoZip with a metal cutting wheel. I finished the cut with a hack saw as I could not get through the pipe with the size of the cutting wheel and position I had to cut. After smoothing up the edges, I soldered on a copper cap. 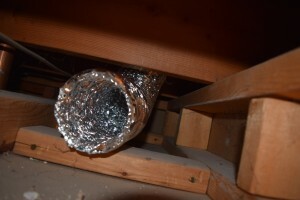 There was a 2″ drain from the master shower that connected to the vent stack that angled across where I could connect to. Since I would be using Schedule 40 PVC, I had to find flexible shielded connectors to go from 2″ copper to 2″ PVC. A 2 inch EPDM rubber shielded coupling P3001-22 is what I used from the local home improvement store. A lot of measuring and preparation is needed to get this correct. 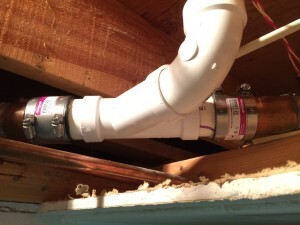 Between the two couplings I installed a 2″ PVC wye. Short stubs of PVC in the wye were calculated. When putting together the pipes, I laid in a small bead of 100% silicon on the EPDM coupling. 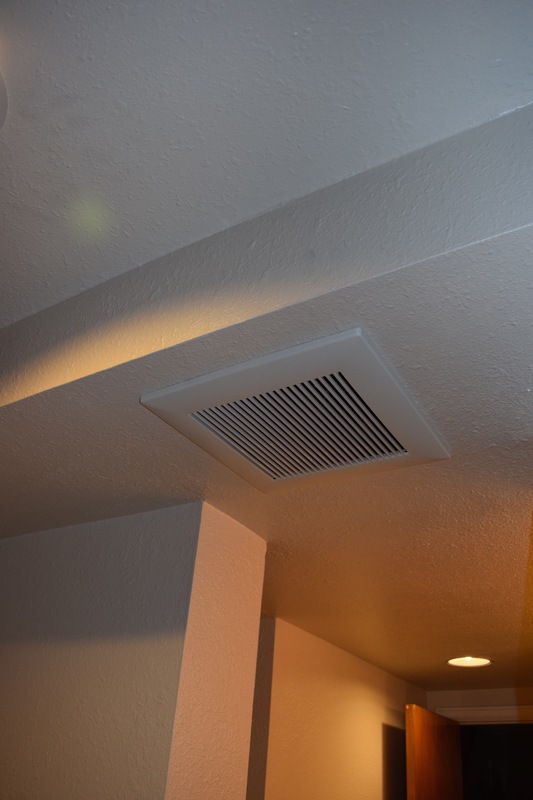 A vent has to be installed in the new line, per code. A sanitary tee will be installed in the 2″ line with a 1 1/2″ line out the top to connect to the vent line in the bathroom wall. After installation, I ran water through the lines to check for leaks. Note: The building code requires the lines to be tested and inspected under test. The Building Inspector said to plug as much as possible and flood the lines with water to check as much of the new piping as possible. He could have made me flood all the new line including the vent line. This would have meant pulling the other sink and toilet in the Master Bath to plug those lines and filling the vent stack. Tip…use a digital camera to take a photo of the attachments to see what type of attachments you have. You should be able to use the faucet wrench described in the previous section to remove the nuts on the faucet. Once the nuts are off, remove the faucet from above. 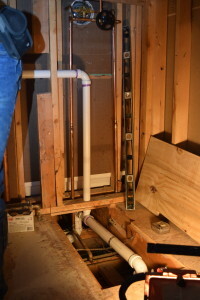 The faucet and the supply lines will come out as a unit, provided the holes in the counter top are large enough to allow the supply lines to come out. Once the faucet is out, clean the area where it was attached. Be careful not to scratch the sink surface or countertop. See how many faucet holes you have…one, two or three holes? This will determine what type of replacement faucet you purchase. If you only have two holes and you purchase a faucet that requires three, you have a problem! Additional holes can be cut but that requires special tools and depends on the type of sink or countertop you have. Now you are ready to install your new faucet. Be sure to read and follow the manufacture’s installation instructions. As before, I recommend you replace the supply lines. Review the installation instructions throughly. The basic procedure is as follows. 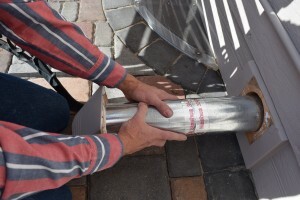 Wrap the faucet water supply connection threads with Teflon® tape. Secure the new supply lines to the faucet. If the faucet has a base plate, install it now. If sealant is required on your faucet, install it per the faucet installation instructions. Install the faucet and supply lines in the respective holes. 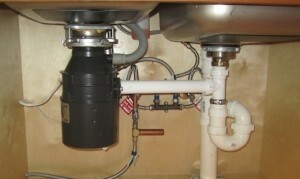 From below, attach the new faucet with the supplied attachments. Attach the supply lines to the shutoffs (see supply lines in the previous section). Many of today’s faucets have a cartridge for the single handle kitchen faucet and some of those cartridges seem to cost as much as a new faucet. Add the cartridge cost to the cost of a trade professional and it is costly. If you like your faucet, I recommend replacing the cartridge. If you want a different color or style, now is the time to replace it. Every brand of faucet is slightly different so the following instructions may not be your exact condition. Try and determine the brand of faucet, Moen, Delta, etc. If you know the make and model of the faucet it will be much easier to find the correct replacement cartridge. If not, you will have to remove the cartridge and take it to the Home Improvement or Hardware Store to get the correct part. When you purchase the new cartridge, it will come with instructions for replacement. Read and follow them closely. The basics for replacement are typically as follows. Turn the hot and cold shutoffs off below the sink. At the faucet, open the hot and cold to relieve the water pressure. Remove the handle(s) from the faucet to expose the cartridge. There will be a small set screw or slotted screw to loosen to remove the handle. Removal of the cartridge may require a special wrench that comes with the new cartridge. Have some rags handy to soak up water during removal. Unscrew the cartridge retainer and set it aside. Gently remove the old cartridge. Take note of the orientation. Replacing the new one the wrong way may have the hot and cold reversed. Look in the opening where the cartridge was in the faucet and remove any debris. DO NOT scratch or damage the interior space where the cartridge was installed. Tip…when installing the new cartridge, a small amount of petroleum jelly on the rubber “O” rings will make inserting easier. Not too much, as it can plug the water ports on the cartridge. 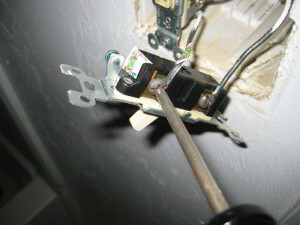 Once the handle is installed, turn it or move it back and forth and side to side. If it is difficult to move, you tightened the cartridge retainer too tight. You will need to remove the handle and loosen the retainer. Turn the hot and cold shutoffs back on. Slowly open the faucet handle to start the water. There will be air in the lines so expect some spurting and loud noise until the water starts to run. Be sure the cold is cold and hot is hot. If not, you reversed the cartridge. It will need removed and rotated 180 degrees. Look for any leaks around and below the handle where the new cartridge was installed. Water supply lines provide hot and cold water to your faucet below the sink. Your lines may be a plated copper lines or a braided lines. 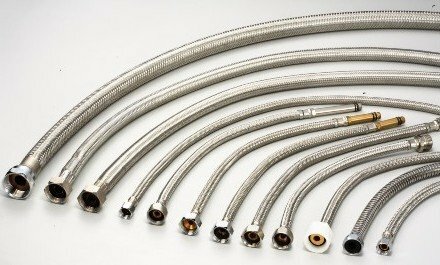 I recommend the braided lines, typically stainless steel braids. They will not burst as easily from water pressure increases or with age. If you are replacing your faucet, I recommend you replace the supply lines. 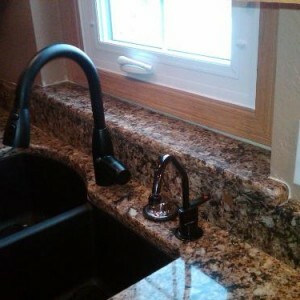 It is much easier now than later when the faucet is installed. To begin, turn off the water supply to both lines. Open the faucet for both hot and cold to relieve some pressure. Place some rags below the area where the supply lines connect to the shutoffs. Loosen the nut on the supply line where it connects to the shutoff. Be sure to support the shutoff with the pliers as you loose the nut. Do this for both lines. Once the nuts are loose, gently remove the lines from the shutoff. Have the rags ready to collect the water. If you open the faucet handle(s) it will allow the remainder of the water to drain out of the lines. If you are replacing your faucet. 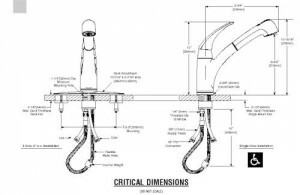 see the section on Faucet Replacement. To remove the upper portion of the supply lines from the faucet, you need to be a contortionist. Many times getting to those lines up behind the sink below the faucet is a challenge. You will have the P traps to get around and possibly the garbage disposal. This is where the faucet wrench comes in handy. It is a long handle with a swivel head and jaws to get to the upper nut. If you have one or can borrow one I recommend it. Otherwise you have to get pliers or a small adjustable wrench on that upper nut. Loosen the nut on the supply line where it connects to the faucet. These can be difficult to remove. Be patient and careful. Depending on the type of faucet, you may need assistance to hold on to the faucet. Do this for both lines. Once the nuts are loose, gently remove the lines from the faucet. Have the rags ready to collect any water. Take one of the lines to the Home Improvement or Hardware Store to get the correct length and size of lines and nuts. I recommend the braided lines. If you do not have Teflon® tape, get some at the store. Replacing the lines is the reverse of removal. You need to place a couple of wraps of Teflon® tape around the threads on the faucet and the shutoffs. Do this before you start. When you wrap the threads, wrap in the direction you will tighten the nuts (clockwise) and be sure not to cover/plug the hole where the water flows. I say this because many times the tape is wider than the amount of threads you have to cover and the tape will wrap over the hole. If you are using the plated copper lines and not the braided lines, you may need to cut them to length. You will also have to install the nuts and compression fittings. These can be tricky and something I chose not to describe in this section. Thus the braided line recommendation. I frequently get asked, “How tight do I make the nuts?” My response is, “Snug.” What does that mean? Good question….I can’t answer that. Tighten to what you think is sufficient. You do not want to over tighten. When you turn the water back on you will know if they are tight enough. 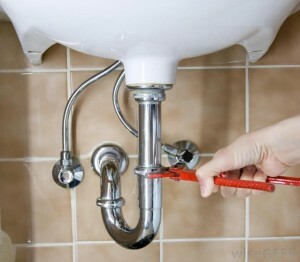 If you get a leak, tighten slightly and check for leaks again. If you have a leak at one of the nuts that will not stop, turn off the water, remove the line and check the threads on the connection. If they are old and corroded you may need to replace the shutoff or faucet. Also check the inside of the nuts on the supply lines. Occasionally I have seen defective seals inside the nuts. If all looks ok, install more tape on the threads and try again. Drain cleaning is not a pleasant task, but a necessity if you want to keep your drains running clear. Set up a regular schedule to flush your sink drains. Monthly flushing should be sufficient, depending on your type of cooking. If you cook with a lot of oil more frequent flushing is recommended. Avoid using strong chemicals to clean your drains. Chemicals are hazardous to wetlands, wildlife, water quality, and can be hazardous to people. Hot water and 1/2 cup of baking soda can help deodorize the drain. The hot water will help remove any built up grease in the drain pipe and P trap. 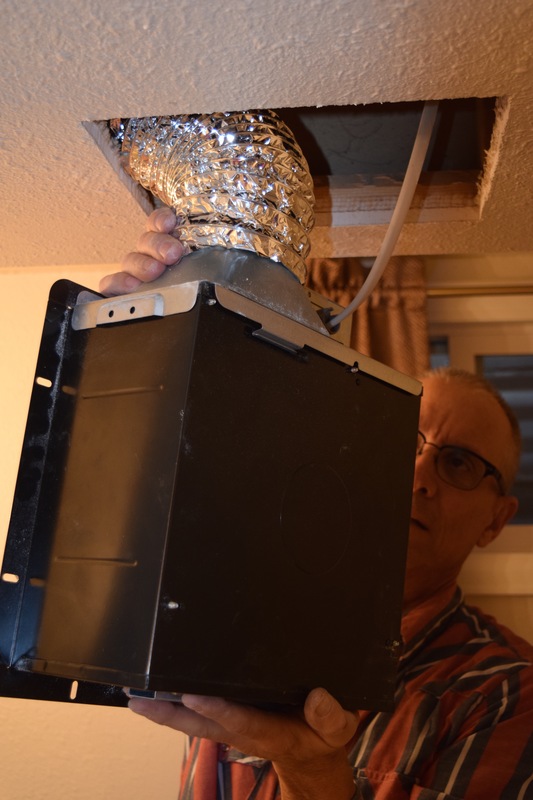 If the drain starts running slow and flushing with hot water does not help, remove the P trap and clean it out as described in a previous article. Your local hardware or home improvement center can help you with selecting a product to put down your drain to help clear it. Most of these chemicals can be caustic and may not be compatible with your drains (depending on age). There are also products to help you maintain your drains. Some are put down the drain monthly to help clear out the grease, etc. Is the sink full of water? If so, you need to remove the water from the sink before proceeding. Otherwise, you are going to get a bath when you remove the trap! If you have a garbage disposal, see that section for checking and clearing clogs in the garbage disposal. Start with the upstream trap. 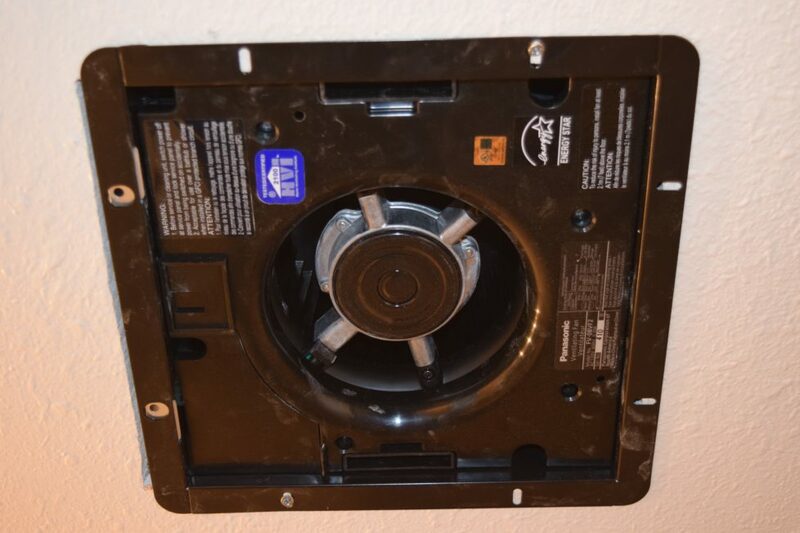 This may be connected to your garbage disposal if you have one. 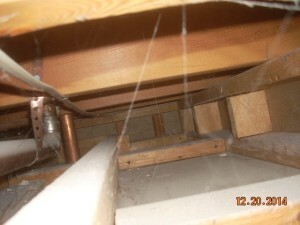 Place some rags on the bottom of the cabinet and set the bucket under the trap. Use the pliers or pipe wrench to loosen one of the nuts on the trap. Be sure to move slowly and hold on to the pipe where you are working. 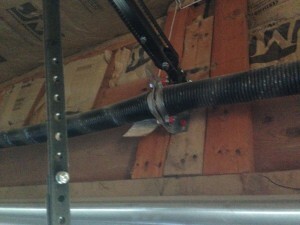 You only want to loosen the one and not the pipe and area above or down the line. Don’t be concerned when water starts leaking, that is normal. Loosen the nut completely and then move to the other nut on the trap. When this nut comes loose the trap will be free so hang on to it. Once the trap is off, dump the water in the bucket. There should be plastic or rubber washers at these connections. Save them for now. Look in the trap you just removed. Most likely you will see black, ugly looking goo. If this is mostly or completely plugged, this was your problem. If not, your problem may be further down the line or between the area you are working and the sink. 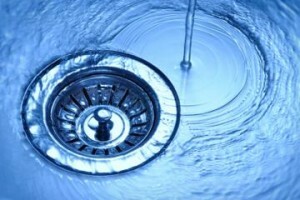 Shine a light down the sink drain from above and see if there is anything visible. 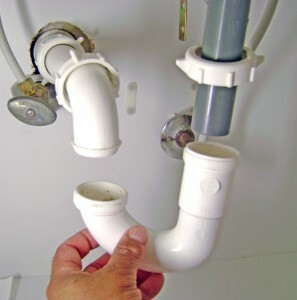 If you have another P-trap below the other sink bowl, follow the above procedure to remove that trap and check it. 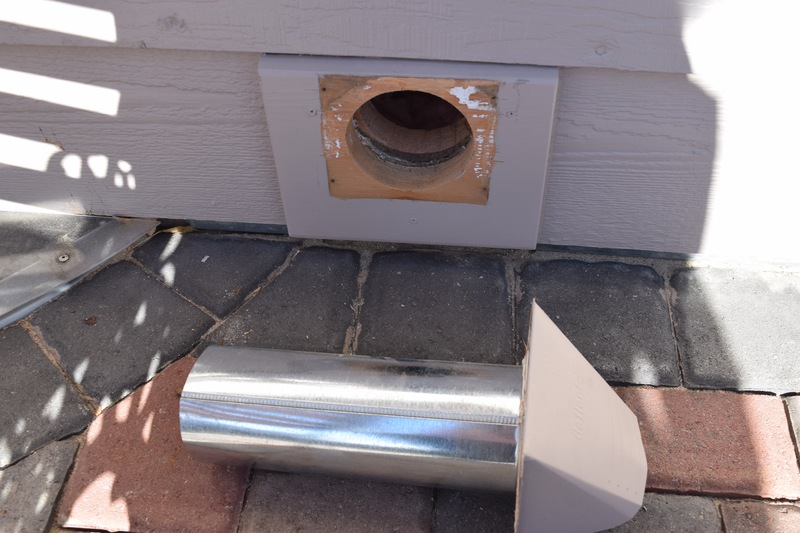 Before you reconnect the trap pipe, I recommend you replace the plastic or rubber seals at the nuts. This can save time troubleshooting leaks. Fit the trap back on the pipes and turn the nuts hand tight. Realign everything and use the pliers or wrench to snug up the nuts. Do not over tighten! Turn the water on and check for leaks. If you have a small drip at one of the nuts you just removed, tighten is a bit more. Check again. Be sure to check other connections that you did not work on as you may have disturbed the connections. Your garbage disposal is designed to grind food waste. Only put down the disposal what it is designed to have. Remember most of the sewage can end up in water sheds or your septic tank and leach field so be kind to the environment. Please, do yourself a favor and read your owners manual or download one for your make and model! It will be your best friend should you r disposal stop working or get plugged or jammed. 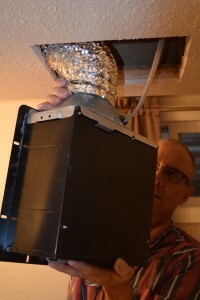 The disposal has an electrical connection so unplug it or turn off the breaker in the service panel before starting any work on this appliance. Two things I learned the hard way not to put down the disposal…cabbage for one. And the other is grease from cooking. The cabbage will just shred and it will plug your drain. The grease will line your drain pipes and cause food and debris to stick and cause a plug over time. The most common problem is a jam inside the disposal from a hard piece of debris like glass or a seed. The object gets stuck between the interior wall and the grinder. If this happens, it may trip the reset button on the disposer. Use a flashlight and look down inside the disposal to see if you can visualize what has jammed the unit. If you can see it you may be able to reach inside with a pair of tongs and remove it. Word of caution, be sure the power is off or disconnected before reaching inside. Hopefully your disposal came with a wrench to help free the jamb. If it does have a wrench, there will be a hole in the bottom of the disposer to insert the wrench. Insert it and work it back and forth to see if you can free the grinder. Once it makes a full revolution, look inside to see if you can remove the object. If you do not see anything, it is possible you may have forced the object on through and into the drain. If the above procedures do not fix your disposer, the motor may be defective and the unit will need replaced. Replacing with the same make and model can be fairly easy. If a different model, you may need to replace the sink drain basket. The good news is that the disposers come with excellent instructions. If you are one that can read and follow instructions you can do this yourself. 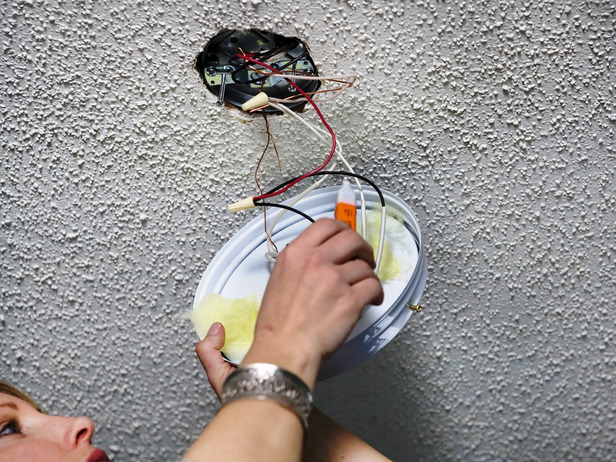 The most challenging procedure for people can be the electrical connections. Even that is detailed in most instruction manuals. Most of our homes have an overhead garage door. Yours may be one large door or one or two smaller doors. Regardless of size, the maintenance is the same. Attached to most of the doors is an electric opener to open and close the doors with a press of a button. The maintenance for the opener will be discussed in the last section of this article. Lubricate the track and rollers and tighten all bolts and nuts. The door(s) may be wood, metal, or composite. Most overhead doors are in several horizontal panels, connected by brackets with hinges. 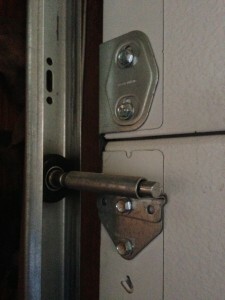 The door is usually opened by assistance from from two high tension springs mounted above the door. Due to the tension in these springs, only experienced technicians should adjust or replace them. The springs can break with age. If one does break, replace both so you have equal tension. Have the springs replaced by an experienced door technician. Other than the springs, there are several maintenance procedures you can do. You should perform monthly safety checks of the door and opener. Annually, check and perform the following. Lubricate the tracks and rollers on the sides of the door with a spray silicone or teflon. Do not use an oil based product as it will collect dust. Do not lubricate nylon rollers. Tighten all the nuts and bolts. This includes those on the door and those that secure the door roller tracks to the wall. If you have a door opener, release the emergency cord and check the door balance that it moves easily up and down. When the spring tension is properly adjusted, you should be able to move the door easily up and down with one hand. 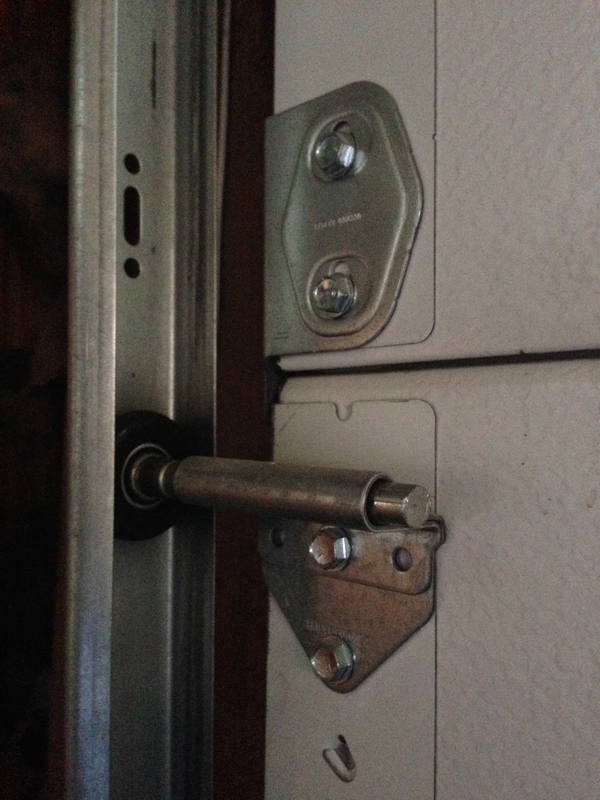 If the spring tension needs adjusted, contact a qualified door technician. Some door manufacturers recommend white lithium grease as a lubricant (see below from Chamberlain). I do not recommend that as it can collect dust/dirt. Every electric opener system is different. If you need help programming your remote, search for the manufacturer’s manual on the Internet and follow those instructions. Check the downward travel pressure for the force limit. Place a small block (2 x 4) on the floor below the door threshold. Press the button to close the door. If properly adjusted, when the door contacts the block it should automatically reverse and open. If it does not, the force limit requires adjustment. From Chamberlain Doors – Lubricate moving parts. Use a small amount of white lithium based lubricant to lube the door’s rollers, bearings and hinges. You may also lubricate the frame of the door opening on the house where the garage door contacts the wood with a regular wax candle. 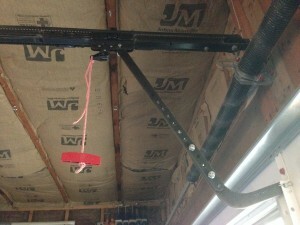 This will help the door slide easier against the house while opening and closing. 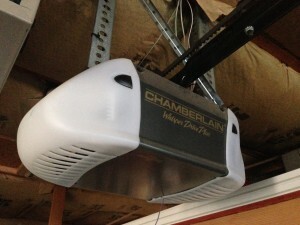 Once every 3-4 years – Re-lubricate the garage door opener rail. Using a clean rag, wipe away existing lubrication from the center rail and reapply a small layer of lubrication. We recommend using a white lithium based grease for all lubrication purposes. Some openers are advertised as maintenance free. This usually means the opener motor. Check your manufacturer for your requirements. Verify the upward travel limit is properly adjusted. Downward travel limit does not need adjusted unless you make other changes to the travel limit of the door. Check the photoelectric obstruction sensors on the lower sides of the doors. Be sure the eyes are properly aligned. Close the door. As it is traveling down, pass an object through the beam. When it senses the object, the door should automatically reverse direction. If it does not, the sensors need adjusted or replaced. 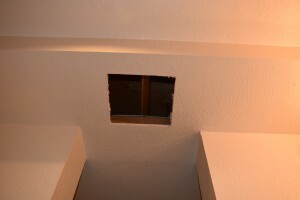 The photo eyes should be installed no more than 6” above the floor. Openers will have a belt, chain, cable, or screw drive, depending on your model. Refer to the manufacturer’s original operating and maintenance instructions. Belts, chains, and cables may need the tension adjusted. The chain or screw drive may require lubrication and will be indicated in your owner’s manual. 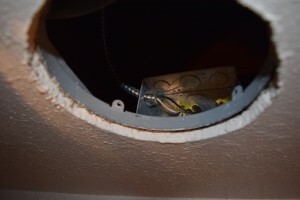 Check the light bulbs in the opener and replace as needed with the proper wattage. Exceeding the recommend wattage will generate excessive heat and could damage your opener. Blow the dust out of your opener. 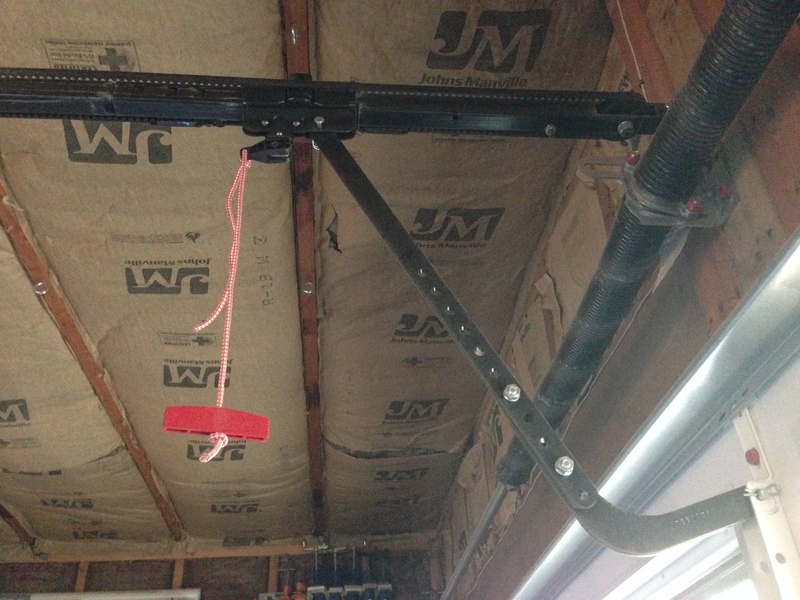 Depending on how you use your garage, the opener will collect a lot of dust. Use a can of air or an air compressor. Getting around the motor area is the most important. Some openers offer battery backup so if the power goes out, you can still operate your door. To test the battery backup, unplug the opener from the outlet and then operate the door using the wall or remote control. There are new technologies now that connect to your opener that can alert you via your smartphone if you left your garage door open. You can open and close your door from your phone as well. Nice options if you are in to technology. As with all products, consult your garage door and opener owner’s manuals for the manufacturer’s recommended maintenance.